If you’re in the market for a bandsaw as a recreational woodworker, then I’ve got a treat for you. I had been looking for a sturdy and reliable band saw for my small shop and read hundreds of reviews to find the perfect one. When I came across the Rikon band saw, I knew it was going to be perfect. Now that I’ve used it many times, I couldn’t wait to get online and share my experiences with you. First off, this bandsaw is only going to be good if you have the proper expectations. If you’re a professional woodworker that’s looking for a full size bandsaw to perform big cutting jobs, then you’ll likely be disappointed in this product. But if you’re like me and just want to have a good bandsaw for the occasional woodworking project, then you’ll be very pleased with what it has to offer. What Do You Get With The Rikon 10-305 Bandsaw? Who Should Buy This Bandsaw? I’ll start by saying that I’ve never owned a bandsaw before this one, but I’ve used one plenty of times. This bandsaw has some of the same features as a full size machine, but you can’t expect it to do the big jobs like a full sized one would. For not setting up one of these before, I thought the instructions were clear and easy to follow. It didn’t take me long to put it together, and it probably won’t for you either. What I really like about it is the fairly spacious work surface. It’s made of cast iron and gives you plenty of room with its 13 ¾” x 12 ½” surface. I’ve seen several bandsaws that compare in size, but none of them had this big of a work surface. The frame is also made of steel instead of plastic, so it just feels more durable and should be able to handle some abuse and wear and tear over time. The motor isn’t terribly strong at just 1/3 horsepower, but remember that you have to have the proper expectations regarding the size of the machine. The guide post is extremely easy to raise and lower, so you’ll be able to make perfect cuts every time. The rip fence that’s included always makes it easier to make cuts, and it can also be removed easily if you don’t need it. The best feature about the Rikon 10-305 Bandsaw with Fence has to be the large workspace that you have with it. Many times you won’t need a lot of space when you are doing large projects, but it’s nice to be able to have enough room when you need it. The ability to adjust the guide post with a simple turn of a knob is also one of the most convenient features. If you’re like me and don’t do a whole lot of projects except for on the weekend, then you want a bandsaw that is quick and easy to use. That’s exactly what you’re getting with this one, so ease of use is definitely one of the best features that it offers. After reading a ton of reviews about this bandsaw, I had the expectations that it would be able to perform similarly to a full size bandsaw, but just with less power. So far, I have to say that the Rikon 10-305 Bandsaw has met my expectations. 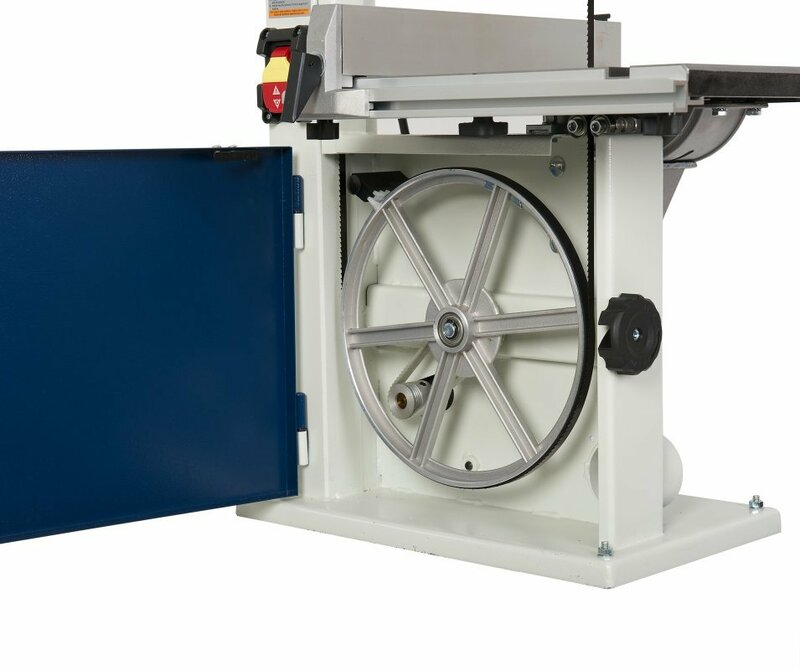 If you’ve looked at or used other 10″ bandsaws before, there aren’t many that have the same type of features that this one does. This model has a little more power and is easier to use than most other comparable models. 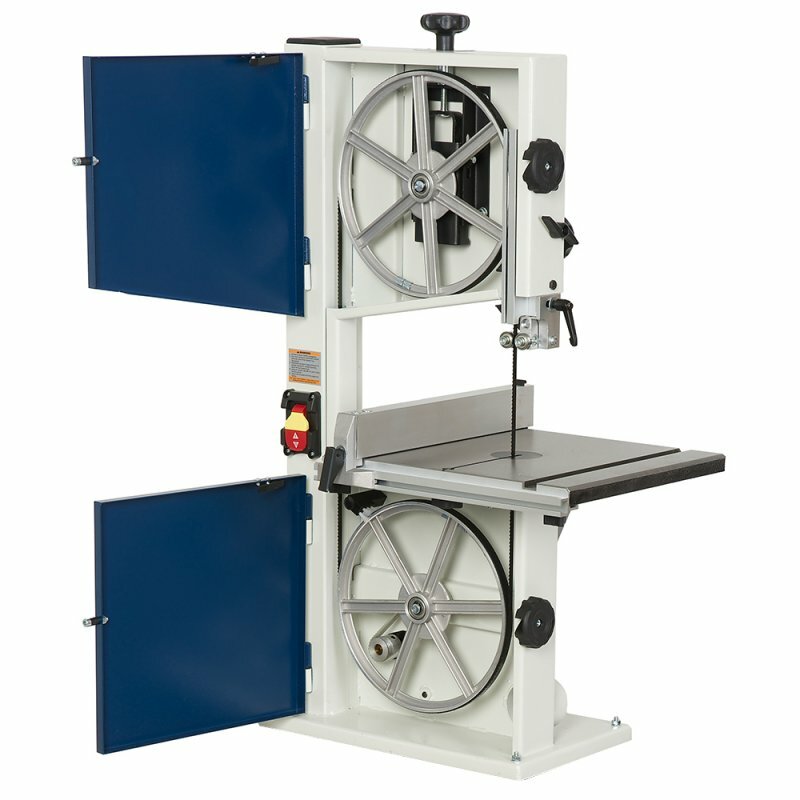 Because of that, it makes this bandsaw an attractive option for people who don’t do a lot of woodworking professionally. This is a recreational woodworkers dream, especially if you just like to do small projects. In my opinion, there just isn’t another bandsaw that compares to it. The Rikon 10-305 Bandsaw is for the person who likes to do their own woodworking, but doesn’t do it enough to justify going into business or buying a large and expensive machine. Professionals probably wouldn’t like this bandsaw because it lacks the power that a full size machine has. But for anyone that just likes to have fun doing little projects as hobbies, this bandsaw is perfect. It will take up a little bit of space in your shop, but as long as you have a shop that’s about as large as a two-car garage, then you should have plenty of space for it. Many people have said that they don’t like this bandsaw because it doesn’t have enough power to get large jobs done. But the fact is that the machine isn’t designed to do those big jobs. In the few months that I’ve used it, I haven’t come across any issues since I’ve used it how it’s designed to be used. The only downfall I can see is when I get skilled enough in the future to tackle a larger project and won’t have enough power to get it done. But that’s probably when it will be time for me to upgrade to a full size bandsaw or just stick with the smaller projects. If you want to do some efficient cutting and need a bandsaw to do it, then you’re not going to find a better option on the market. However, be aware that this is not as powerful as a full size band saw, so don’t expect it to be able to handle large jobs. With that said, the value that you will receive for the Rikon 10-305 Bandsaw with Fence is unmatched. You won’t have to break the bank in order to get one in your shop and it will make your woodworking hobby much easier and more fun. If you’ve been thinking about getting a bandsaw for your shop, then don’t waste anymore time and purchase the Rikon 10-305 Bandsaw with Fence today!